Ideal for inspection of sprayed coatings as they are happening. Jobsite lighting is an unfortunate necessity and a real pain in the neck for professionals in all trades, whether you work in residential, commercial, new construction or remodeling scenarios. Frequent power problems, general lack of outlets, and insufficient natural light leave us craving more light at work. Or, should we say “better light”? Halogen towers, fluorescent bazookas, incandescent drop cords and string lighting are cheap, fragile, unreliable and potential safety hazards on the job. They are also disposable. Over the years, my company has thrown an embarrassing quantity of broken down or dead light units into dumpsters, only after having spent time and money replacing bulbs, plugs, cords, cages, nuts and bolts on them. Generally, if the jobsite elements and personnel don’t kill them, the lights themselves will self-destruct in untimely meltdowns. I have found myself using my iphone flashlight app on jobsites more than I care to admit, and I do carry a camping style headlamp in my toolbox. This is how bad the lighting scene has become. 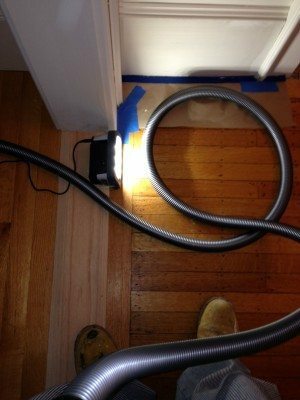 In 2011, FestoolUSA submitted to us their idea of better jobsite lighting, and this review is the result of 18 months of cohabitation with a pair of SysLites in my paint company and life in general. The Festool SysLite is a lightweight and robust cordless LED worklight that is small enough to be used as a handheld spotlight for inspection of task details, and can also be hung from its own foldaway swivel hook or mounted on a standard camera tripod. It can be set on flat surfaces (such as floors, shelving or countertops) where its unique design offers 3 different setup positions that allow light to be projected at angles of 10, 15 and 30 degrees. Additionally, the Syslite can be laid flat on its back to project light vertically, and there are high and low settings for light output. The SysLite is much smaller than typical worklights, at just 3 1/4″x4″x5 7/8″, and weighs less than a pound. It has six led lights (3 watts per) that produce bright but cool light that is focused within a 170 degree radius. Focused light dispersal is one of the qualities that distinguishes this design from the other light types which spread light in more of a 360 degree fashion, and create wasted energy – particularly in the form of accumulated heat within the housing of the light. In traditional lights, it is the heat generated through the light’s own inefficiency (of design and energy consumption) that lead to the demise of the light. In addition to its internal design efficiency, there is little about this light that is externally breakable. There is no permanently exposed wiring. The lens is plastic and easy to keep clean (without ever having to remove). The housing is robust, and even the charger connections are stout yet sophisticated. The SysLite is an engineering achievement in the sense that it turns the classic weaknesses of other types of work lights into its own strengths. There is nothing particularly breakable about it, and it requires no maintenance. While I described the SysLite as “cordless” at the beginning of this section, it is worth noting that there are really three power options for using this light. In its “cordless” mode, the SysLite runs off its own (7.2v) internal battery, which takes about 3 hours to fully charge and produces 90 minutes of cordless use in the high setting and 240 minutes in the low setting. It is also possible to run the SysLite by using compatible battery packs from other Festool cordless tools, which include any BPC or BPS series pack. When using an external Festool battery from a cordless drill, for instance, the SysLite’s internal battery is bypassed, and you can get up to a few hours of usage from the external battery pack, before switching to the internal battery or the corded mode. Battery compatibility is a desirable feature in any cordless tool. We find it practical when working in good outlet proximity to run the light as a straight corded tool. Those of you who are already working within a Festool system will enjoy the convenience of plugging the SysLite into the socket on your Festool extractor and letting it ride along onboard the hose garage or WCR. This configuration allows you to be using the light while keeping a continuous charge going to it. The cordless mode is great to have available when portability is critical. If the SysLite has a specialty on the job, it is in the areas of small task and inspection lighting. Syslite easily mounts on a basic camera tripod. Because of its compact size and design, the SysLite can go places with you that other lights cannot, such as inside closets, cabinets, attics, crawlspaces, in a spraybooth, up a ladder, on staging, etc. It is a great way to inject some serious light into situations where other lights would be awkward, or where you would not want to attempt to take them for temperature or space reasons. The SysLite is a great inspection light for finished surfaces, particularly for painters, as it’s “white” light yields truer color representation than other light technologies that are more “yellow”. Also noteworthy is the SysLite’s temperature sensor, its own self protective check/balance system that will shut the light down if operating temperatures are too cold or too hot for it’s own good. We never saw this feature activate in any kind of conditions, but its good to know that it’s there. I do not mean to pigeon hole the SysLite as only suitable for small task or inspection lighting applications. However, one SysLite is not enough to light a typical room for detailed work such as painting. In my opinion, one SysLite is about the equivalent in usable work light as a 250 watt halogen. To really light up a room, the ideal setup would be 2 sets of 2 SysLites swivel mounted on tripod stands. At $175 each, this would be $700 in lighting, and decent camera tripods can be purchased for under $50 each, which keeps the entire ultimate SysLite setup well under a grand. Seems like a lot on first glance, but not so much when weighed against all the lights you have bought and tossed over the years. This one won’t end up in a dumpster, and is backed by a 3 year manufacturer warranty. Most lights I have owned have self destructed in less than two years. You can bounce the Syslite on the floor and it will not break. I have even seen video of a SysLite being run over by a truck and continuing to work. It is indeed a shatter proof and virtually unbreakable design that also won’t burn you or anything else in its path. You won’t have to handle your SysLite with any more care than any of your other tools. As you can see in the video, the SysLite is particularly helpful in lighting up prep and spraying processes. It is unmatched in its ability to work close to wet paint without introducing heat that would impact drying or obnoxiously “bake” paint fumes like halogens do. You can have a paint thinner rag hanging from your hammer loop and not have to worry much about spontaneously combusting yourself. There are certain cordless tools that are as handy to have around in your personal life as they are in your professional life – the ones that you always want to have in your truck or within reach (we could say “on call”) seven days a week. Drills and impact drivers are great examples of this boundless practicality, and the SysLite quickly ascends that category by easily justifying the space it occupies in your truck, shop or home when not on the job with you. It is convenient and easy to leave the SysLite car charger set up in the truck, so that it can be recharging during commute times, and doubling as an onboard spotlight for unloading the truck back at the shop, or whatever may happen during the night where a good dose of lighting superpower would be helpful to incur. We had numerous power outages in 2012. and there is comfort in being able to charge a light like this off your truck battery and produce a few hours of light during an outage. The SysLite is also handy to have around hunting camp or the woodshed, and not a bad Halloween night beacon for those who take their kids trick or treating. Tools that easily crossover between professional and personal use are somehow a little easier to justify owning. A single SysLite fills the gap between your small LED headlamp and your large million candlepower spotlight, while a team of SysLites represents a highly effective overall jobsite lighting solution. Was using mine today, except the battery red light came on, an I used it anyhow, and it got wicked hot, turned it off, called Festool, left msg with details. They called me back in 15 minutes, and gave me return label email and suggest the battery might be defective… oh well, I’ve had for two days.. I tried it an hr later and it charged up ok…. but it will still go back as soon as I finish up my little hallway and bathroom job. Cuz it’s a perfect light for me….. notice that light nxt to my new $85 hose, I know it’s not going to melt it…. It is a handy little light, Steve. Yes, if that was a halogen in the picture, that hose would be half liquid form pretty quick! Thanks for writing. Keep us posted on how your syslite works for you over time. I’m sure it’s a great light, but is it worth the $200? Ken, thats a good question and it depends on your (and everyones) specific needs. If you just need mass lighting to illuminate the largest amount of space as cost effectively as possible, it is not going to be the most practical solution. For smaller scale, detail work situations where quality of light, temperature and portability are important, yes, the value is definitely there. In our case, as painters, its great to mount on a tripod, illuminate a window unit with white light, and do detail work without heat involved. It is also the best inspection light I have found for inspecting surfaces prior, during and after painting. Great to hear, Nic. The tripod is key. We find ourselves constantly using the syslite to inspect surfaces, both wet and dry. And, they are just about indestructible. Nice to have one less pain in the neck on the job. Glad its working out for you.